On Sunday 13 January 2019, the sad news of Philemon Masinga's passing filtered through from his native South Africa. He was only 49 and the victim of cancer. Back in the summer of 1994, Howard Wilkinson brought two South African footballers to Elland Road. Both were unknown and both were raw. Phileomon "Chippa" Masinga signed from Mamelodi Sundowns and Lucas Radebe signed from Kaiser Chiefs. Having been spotted playing in an international fixture, Leeds moved quickly to sign the pair and there was rumoured interest in Masinga, a tall unorthodox centre-forward, from Bobby Robson's Porto. The South African striker would provide competition to Brian Deane, Rodney Wallace and the emerging talents of Noel Whelan and Jamie Forrester. He hit the ground running in pre-season, finding the net on a regular basis and made his debut on the opening day of the campaign, replacing Wallace, in the closing minutes of a 0-0 draw at West Ham United. Having made his first start in the following fixture, a 1-0 win over Arsenal, Masinga kept his place for the visit of Chelsea and he found the net just three minutes into the game when he headed Gary McAllister's cross past Dimitri Kharine. Masinga was exceeding expectations and became a permanent fixture in the starting line-up until an injury at Sheffield Wednesday at the end of September kept him out of action for a month. On his return he was restricted to appearances off the bench until he started a game away to Arsenal, the final fixture before a busy festive programme. Leeds triumphed 3-1 at Highbury and Phil Masinga grabbed two that afternoon, only being denied a hat-trick when Vince Bartram produced a fine save at his near post. His second goal that day encapsulated what the striker was all about. Ray Parlour lost possession on the edge of the Leeds area and Brian Deane hammered a ball over the top which Masinga ran onto. He worked his way into the Arsenal box, going past two defenders, in determined fashion, before poking the ball past the 'keeper after his initial effort was saved. After the victory in North London, Leeds went four league games without a goal although there was some respite in the FA Cup Third Round. The Whites had salvaged a draw away at Walsall with an 86th minute equaliser from David Wetherall but in the replay, ten days later, Masinga took centre stage. The regular 90 minutes had passed with the score at 2-2 and he came off the bench at the start of extra time to replace Wallace. Within a nine minute spell, Masinga had bagged a hat-trick to send Leeds through to Round Four and the goals would continue. Having seen his troops struggle in front of goal in the Premier League, Sgt. Wilko addressed the issue by signing the Ghanaian powerhouse, Tony Yeboah and ironically, on the night that Yeboah made his debut, coming off the bench to replace Masinga, Leeds scored four against Queens Park Rangers, without reply, and the South African bagged another brace to make it eight goals in 19 appearances, with seven of those coming on as a substitute. 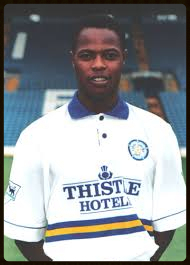 Masinga more than played his part that season with Leeds qualifying for the UEFA Cup but by the end of his contract, injuries had hampered him and unfortunately, he failed to gain the necessary work permit required to stay at Leeds and he moved on to Swiss side, St Gallen in the summer of 1996. The tall, gangly striker was appreciated by the Elland Road faithful who took him to their hearts. His wholehearted approach to the game and style earned him the nickname 'Waltzing Masinga', never more evident than that afternoon at Highbury in December 1994. "Chippa was a great lad who had all the tools - strength, tricky feet and a good finisher. He wasn't the quickest but he was effective. He played the game with a smile on his face and he was a great character in the dressing room. "However, there was one occasion which all the lads remember, when I got on the wrong side of Phil. We were playing away at Crystal Palace on a Tuesday night and travelled down on the day of the game. As we were going through London, Wilko stopped the coach and we had a light training session on a common. "We were doing a keep ball session 9 v 9 and I was expecting the ball from Phil but he didn't pass. I shouted out referring to him as stupid. Well, he didn't take kindly to that and chased me for a mile across this common with Wilko bellowing him to stop and go back to the group. All the lads were in fits of laughter but it's a good job he didn't catch me! "The incident was soon forgotten. We had a good social life at Leeds and Phil would love the banter, he settled in well and lads like Mark Tinkler, Gary Kelly, Lucas Radebe, Brian Deane, Rodney Wallace and myself, stuck together. We had some fantastic times. "As our careers took different paths, I was playing for Wigan against Bari in a pre-season friendly. Phil was with the Italians and it was great to see him again, we had a good catch up. "I knew he was poorly but his passing came as a huge shock. Not only was he a team-mate, he was a mate and he will be missed by everyone who was at the club back in the mid 90s." The striker made 39 appearances for Leeds United, 13 of those were as a sub and he scored 11 goals, the last of which was in the League Cup Semi-Final, 2nd leg win over Birmingham City in February 1996. Rest in peace Philemon Masinga and thank you for your contribution.